Eugen Normand, A Student’s Dream, tinted print, 1932. NML Medical Museum collection, MG 437. The Visual Art Collection of the NML Medical Museum includes plastic art objects – above all, the sculptures of the Würtz Collection – as well as paintings, drawings and prints, processed and catalogued in the Medvik library catalog. 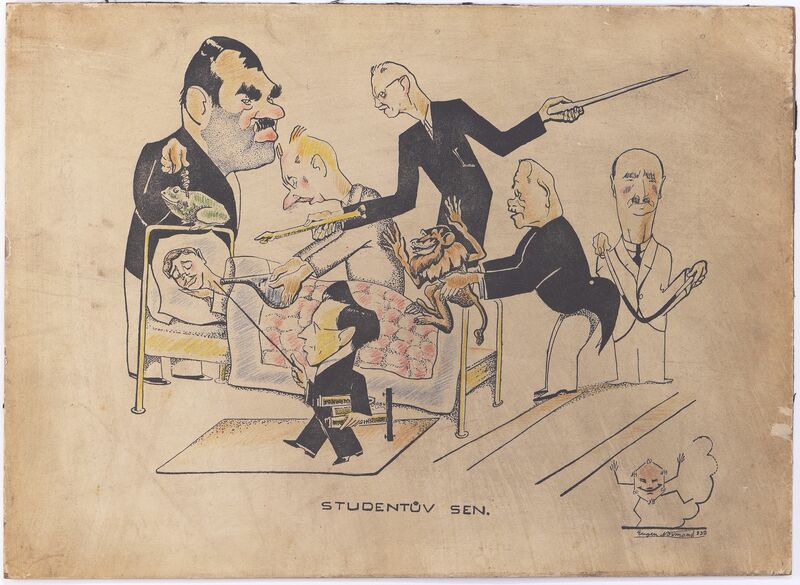 The collection includes caricatures of important personages of pre-war medicine. Three of them, designed by the painter, sculptor, graphic artist and illustrator, director and actor Eugen Normand (1891-? ), portray professors of the Czech Medical Faculty in Prague as seen by medical students. The tinted print named “A Student’s Dream,” dated 1932, depicts a medical student’s nightmare in the night before the first oral examinations. The examiners of all the six disciplines tested at the first “rigorosum” assembled over the body of the sleeping student: from the left, we see the physiologist Antonín Hanák (1889-1935), dissecting a frog, the chemist Antonín Hamsík (1878-1963) with a flask, Karel Weigner (1874-1937), the Professor of Anatomy, holding a cursor in one hand and a skeleton’s forearm in the other, followed by Vladislav Růžička (1870-1934), the biologist with a monkey. Aside from the others, with an X-Ray lamp, we see Václav Posejpal (1874-1935), the teacher at the Natural Sciences Faculty responsible for physics examinations of medical students; the histologist Jan Wolf (1894-1977) stands in the forefront with a microscope. In the front right corner, a cyanuric acid molecule dances and laughs merrily. We can only guess whether the artist had a reason to include a diagram of a compound used in swimming pool disinfection, or whether barbituric acid was intended and the formula is simply missing an NH group. To graduate in medicine, a student had to pass three strict (rigorous) exams: the first in theoretical disciplines, the second in anatomy, pathology and pharmacology, the third in clinical and special subjects. The form and the content of the exams changed over time, According to the 1899 decree on medical exams, novelized in 1903 and still valid law in 1932, the first rigorosum included theoretical exams in theoretical physics and general biology and both theoretical and practical exams in chemistry, anatomy, histology, and physiology. The examination did not take place in one day as it did in the 1850s: the individual exams were to be spread over no more than three weeks. In a feuilleton published in 1900, Professor Ondřej Schrutz wrote that “everyone will agree that the first rigorous examination should be taken as quickly as possible, as the student can later calmly and fully devote his attention to pathological and clinical subjects, undisturbed by the individual exams of the first examination.” The 1902 and 1903 amendments to the decree allowed two-week and, in emergency situations, even longer intervals between exams; the first examination stretched over the 4th and the 5th semester of study. During the 1920s and 1930s debates on the reform of medical studies, the Education Ministry and some professors advocated the shortest possible duration of the exams; student organizations sought extending it over the longest possible time. The nightmare of being suddenly encircled by examiners may reflect these disputes as well. Two other prints by Normand in the Museum collections, group portraits of professors of theoretical and clinical subjects respectively, were commissioned by the Czech Medical Students Union on the suggestion and to the benefit of the Purkyně Support Fund, created in 1887 to help impecunious medical students. Professor Weigner with his cursor and prof. Růžička and his monkey appear on the earlier caricature of theoreticians: there, a frog is held on a leash by the physiologst František Mareš, already retired in 1932. We do not know exactly what occasion inspired the ”Student’s Dream”: it may have been intended as next in the series and never produced. In 1930, instead of further caricatures, the Union financed an etching of J. E. Purkyně, followed by stickers with the scientist’s likeness. The Chair of the Union, MUC. Josef Nováček (1910-1987), reported in 1934 that “no further caricatures were published in the fear of possible [financial] loss”, but the controversial theme of the curriculum reform or discomfort of some of those portrayed may also have prevented the project. Eugen Normand was born on July 2, 1891 in the village of Ciutulesti, in the Floresti District of contemporary Moldova. After graduating from the Akkerman Men Gymnasium in Cetatea Alba (today Bilhorod-Dnistrovskyi, Akkerman in Turkish) he studied law in Kiev and Odessa, before emigrating in 1920, first to Romania and then to Prague. In Prague, he enrolled in the Russian Law Faculty and later in the Ukrainian Studio of Plastic Arts (USPM) to study sculpture. Since mid-1920s, he published his drawings in the Švanda dudák (Schwanda the Bagpiper) comic magazine and theatre cartoons in weekly press. As a sculptor, he portrayed the Prime Minister Karel Kramář or the émigré poet Danyl Ratgauz (1868-1937). His main interest belonged to the theatre. With a group of young actors hailing from Russia, he founded the Theatre of Emotions (Teatr nastroenii) in 1923; in 1924, he left the group to join the Russian Dramatic Theatre of Olga Chovancova and, in 1926, the First Prague Russian Theatre of Vladimir Chinkulov (1890-1956). He performed in various venues as entertainer and comedian, both for the Russian and the Czech-language audiences. From 1933, he worked with the Russian Dramatic Group of Olga Dneprova: he directed Valentin Katajev’s The Path of Flowers in 1934 or V. V. Shkvarkin’s Lyre for Hire in 1935. In 1935 he was cast in the film „Shipwrecked in Paradise,“ filmed by the DeltaFilm production company on the Croatian coast, the film was, however, never completed. In October 1935, the Russian Dramatic Theatre in Riga asked Normand and his fellow actress Tatiana Ratgauz to perform in Riga. He returned in 1936 to direct the play Happy Wedding by M. Triger on the stage of Umělecká beseda, starring T. Ratgauz. Nothing certain is known of his further fate: some sources say that he vanished in Romania in the late 1930s, others report his appearance in Paris as director and entertainer as late as 1955. 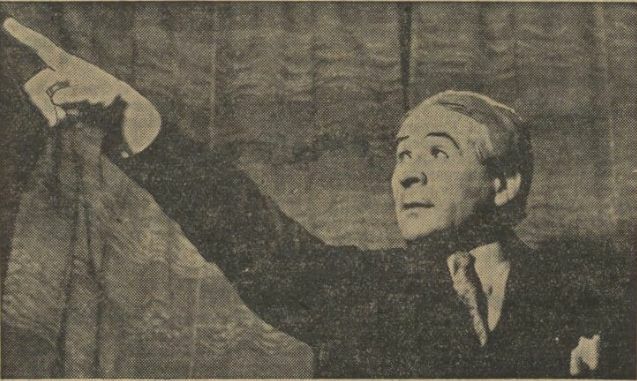 Eugen Normand as Sasha Bystry in Vasilii Shkvarkin’s Lyre for Hire. Prague, Umelecka beseda, February 27, 1935 (Narodni listy February 27, 1935, 5). This entry was posted in Object of the Month and tagged výtvarné umění.